Are you one of the millions of fans who loyally adore all the adventures and characters of Middle Earth? If so, you’ll love the personality chart you can use to find out which Lord of the Rings character has your personality type by using the graphic listing created by Anne Dye from Churchmag.com. 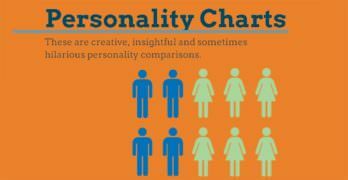 Personality charts are a well-known and extensively researched assessment tool used by psychologists in order to better understand a person’s characteristics. The Lord of the Rings personality chart is playfully but skillfully chart based around these widely used psychological assessment tools. 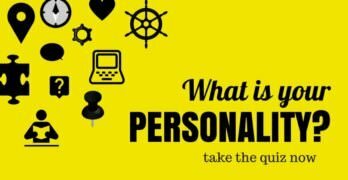 By using the Lord of the Rings personality chart, you can compare yourself with all of your favorite and most beloved characters of Middle Earth to find out who shares your personality type. Are you practical, logical, and above all else, loyal? 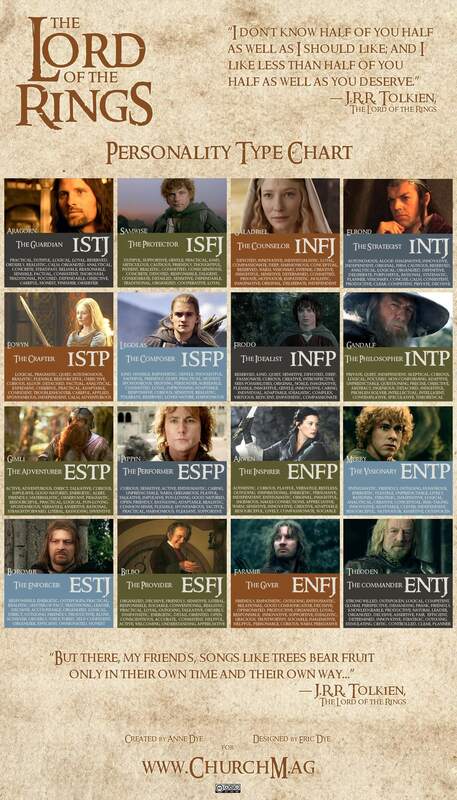 Then you might score as an ISTJ, the personality type of the King of Gondor and master swordsman, Aragorn. While those of you who consider yourself a harmonious visionary, with intense determination could possibly have an INFJ personality, something you would share with Galadriel, Queen of all Elves. For all of you who’s dream house is a hobbit-hole, you will surely have fun determining which hobbit from the Shire you are most like. For instance, the lovable hobbit Frodo is known as ‘The Idealist’, who is naturally compassionate, noble, curious, and caring. If this sounds like you then you would probably test as an INFP personality type, just like the ring-bearer Frodo! Perhaps you consider yourself to be the great and powerful warrior type. If so, your personality most likely lines up with characters such as Boromir “The Enforcer”, Gimli “The Adventurer”, or Elrond “The Strategist”. The timeless and classic story of Lord of the Rings, written by J.R.R. Tolkien, is a literary masterpiece that will continue to spark the imagination of many generations to come. By using the Lord of the Rings personality chart, you can once again explore the exciting adventures and endlessly interesting characters of Middle Earth. That’s interesting. Frodo is my absolute favorite. Wouldn’t take my eyes off him when he’s on the screen. I adore him because I always found myself in him. I too am, like him, very caring, compassionate towards every living being, remain mostly quiet, and curious to the T. No wonder now as to why he has always been my favorite. So, it’s INFP for me then!!! Will tell all my friends to try this. It’s actually really fun.